Gas/Electric Hybrid. Natural gas. LPG. Pure Electric. Hydrogen. BioDiesel. Plug-In Hybrid Electric (PHEV). Conversion to run on vegetable oil. 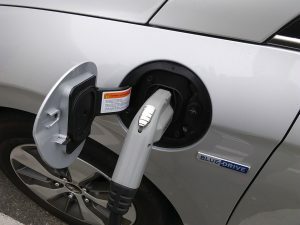 Every carmaker in the world is trying to figure out the best and ultimate “alternative energy” powertrain scenario that’ll be the ultimate magic bullet able to deliver less reliance on fossil fuels, ultra low particulate emissions, low cost and superlative fuel mileage range, all with good performance. Nobody has it figured out yet. Honda and Toyota really rocked the building a few generations back with their first hybrid, of course, the original Insight and Prius. When you say the word hybrid, I’ll bet it’s the Prius that comes to most minds. And rightly so, as this now lineup of gas/electric hybrids is still in production, and outsells everything else in the passenger car green vehicle landscape. And they work; as the cars deliver outstanding mileage, barely there emissions, and relatively low cost given the expense of the technology. Hyundai has taken the concept to another level with the Ioniq. Because every Ioniq is equipped with some sort of alt energy/green powertrain – you cannot buy an Ioniq that runs only a conventional gasoline fueled internal combustion engine. 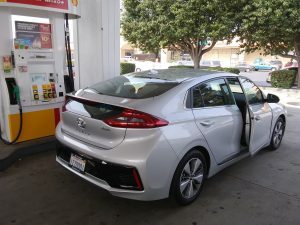 Hyundai offers the Ioniq driver three choices: conventional gas/electric hybrid, Plug-In Hybrid Electric (which gives you a certain number of pure electric battery drive miles before the gas engine cuts in) and a pure Electric model. I recently needed to drive from my SoCal home to the Monterey Peninsula, which is about 400 miles each way, so adding in local driving it seemed to be lining up to be a 1000 mile trip in 3 days. With gas nearly four bucks a gallon, something with stellar mileage and good range seemed like the hot ticket. 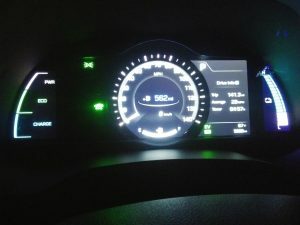 I’d previously driven the conventional hybrid and Pure Electric versions of the Ioniq so my little road trip seemed like the perfect opp to test out the PHEV model. 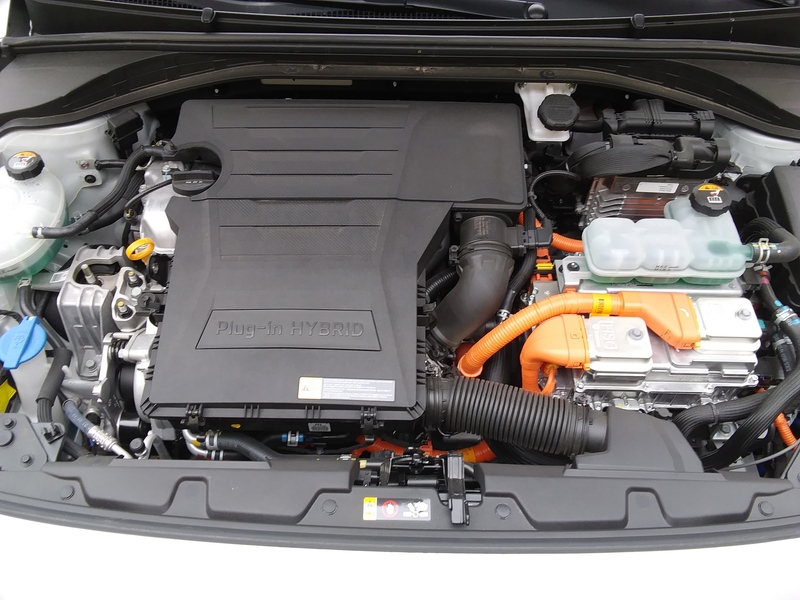 The EPA rates this car at 91 eMPG, and 52 mpg when in conventional hybrid only mode, all equally a range of over 600 MPG with a full charge on the plug-in primary batteries and a full tank of gas. The Ioniq is an eminently practical and usable package; it puts down about the same size overall footprint as does a Prius, that being a compact nearing mid-size 4-door sedan with a rear hatchback (so I guess that’s a 5-door). It’s plenty roomy inside for 4-5 average adults, and when you lay the second row seatback down the cargo area is positively huge. Everyone has their own taste of course, but to my eyes the Ioniq is a much better looking car that the sharply creased and someone George Jetsony looking Prius. Ioniq’s powertrain blends a 104 horsepower four-cylinder gas engine with a 60 horsepower electric motor. The transmission choice here is one of the things that in my mind sets the Ioniq ahead of the Prius; that being its 6-speed dual clutch transmission (DCT), as compared to the Prius’ continuously variable automatic (CVT); the Ioniq’s DCT is mechanically speaking, a manual transmission with two clutch packs and a robotic shifting mechanism, so it’s much more efficient than a conventional automatic, but in practice is just as easy and intuitive to operate. 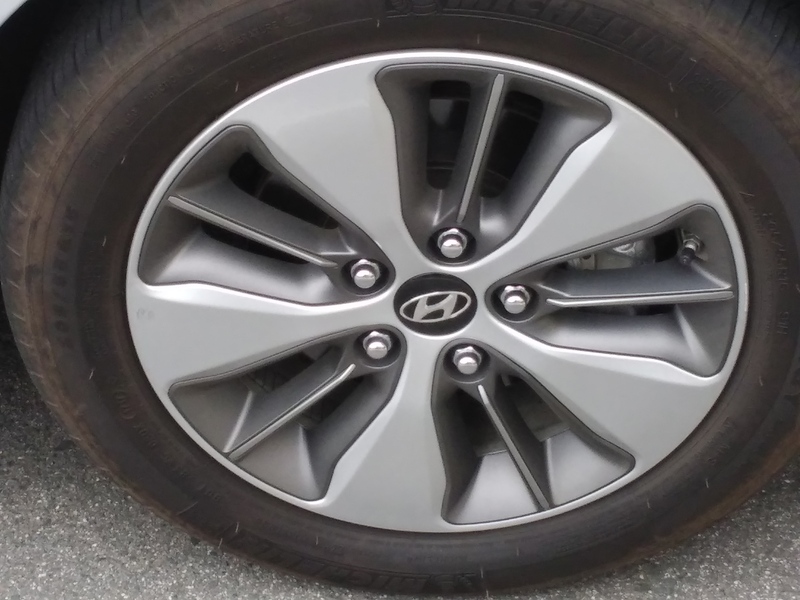 And much more “normal” feeling than the Prius’ CVT with its constantly cresting and falling rpm levels and droaning up and down the engine’s rev range that some people call “motorboating.” Hyundai invested heavily in its DCT technology, and it pays dividends in both the Ioniq Hybrid and Plug-In Hybrid models. Check out that range! 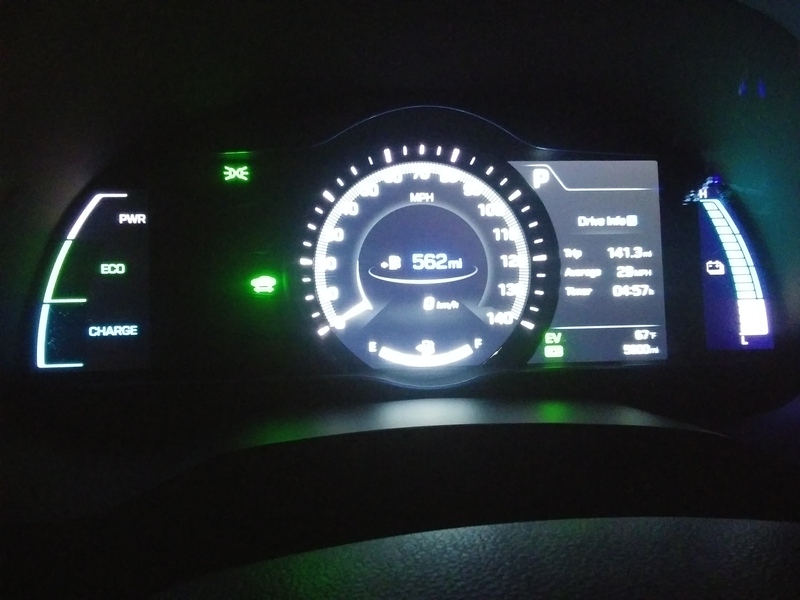 Instrumentation allows you to keep an easy eye on fuel and charge levels, plus range, distance to empty and mpg. 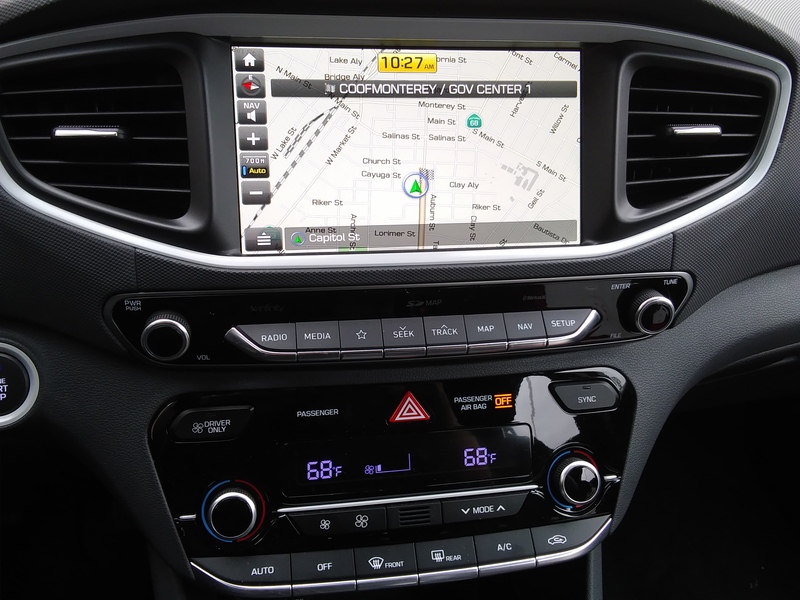 My tester was a 2018 Limited model, which means its fully loaded with all the comfort and infoainment options you could ask for: Nice leather interior, power moonroof, power everything else, and superb connectivity and nav system. It all worked superbly, and something else pretty nifty about the nav system is that it shows and will direct you to nearby electric charging stations via touch screen. One of the great benefits of a plug-in hybrid is that you have no “range anxiety” as you might with a pure electric. Hyundai says you get 29 miles of pure electric range prior to the gas engine having to cut in to work with the electric; in practice, I found this estimate a tad low, as I was able several times to get near 35 free miles of pure electric range (of course this depends on how and where you drive, road conditions, and how many of the electric accessories you are using). The point being is that its cost only pennies to charge the batteries and get that 29-35 miles of pure electric drive, but if you don’t want to charge the car or can’t, then you’re not stuck with no way to go. Of course not charging the batteries means you don’t get the uber most efficient mileage out of the car or those “free miles” but if you can’t or don’t want to charge, you just get in and go like any conventional hybrid. Best of all worlds. And this car is a joy to drive. I find it preferable to the Prius; with a nicer interior, more supportive seats, and again lots of infotainment and connectivity that all works a treat. And don’t worry about acceleration or power; it’s got plenty of punch in either pure EV mode or in gas/electric hybrid modes; the low end torque in pure electric mode is really impressive; this car punches hard off the line and makes easy work of any onramp. And what of range? Lots! I drove from LA to Monterey, and could have easily driven home again without recharging the batteries or filling the gas tank. I drove around Monterey quite a bit, and the whole trip only cost me but two tanks of fuel there and back. 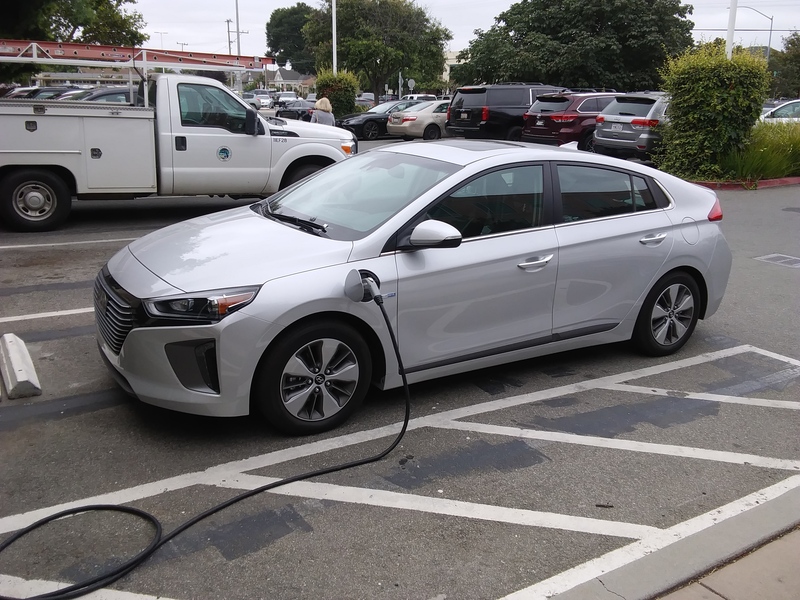 In order to sample the public recharging experience, while In Monterey I asked the Ioniq’s nav system to direct me to the nearest recharging stations, and although the system worked perfectly, there were a few minor inconveniences associated with it. The first motel parking lot it sent me to had one charging station, which was occupied. I didn’t want to wait for that guest to pack up and leave so I went to the next, which was another hotel that had a bunch of stations but they were all equipped with the Tesla charging plug, different from the SAE plug that nearly every other electric car now uses. Third time was the charm; I swiped in my credit card, and charged the batteries to near full in the half hour it took to eat a quick lunch, then back on the road. It was otherwise painless, and the cost was so small I don’t even remember seeing it or the amount on my credit card. Only two very minor negative observations about this really fabulous car, one is that while it does offer heated seats, it doesn’t offer the cooled vented seat option. And an electric rear deck opener/closer would also be nice, as the decklid opens pretty high, and is heavy to pull down, something more petite women may not appreciate. This is a superlative automobile. Its beautifully built, well equipped, nice looking and comfortable, fun to drive, a solid performer and delivers on its mileage and range promise. The other driver in my household, who now drives a KIA hybrid, and has also owned a Prius, wants one as her next car, which I suspect will happen.